Yet blogging is one of the top 3 most effective ways to build your business, ANY business, B2C OR B2B! Why does blogging work so well? I could talk about powerful “soft” factors that are key to generating sales, like trust, credibility, referrals and more. Each of those are key elements that come from blogging. They’re real, they’re very real. They’re just a bit harder to quantify for most companies. Instead, let me focus on the data we can easily obtain from our analytics SEO tracking programs, what I’ll call the Hard Data. Every time you write a blog post, you add another “asset” to your inventory of marketing content. The search engines add that page to their index, increasing the chance you have of having your site appear in the top search engine listings when someone searches. Simply stated: the more quality blog posts you write, the more you’ll get found in the search engines and the more traffic you’ll get to your site. Some people don’t understand this, mistakenly believing that most people come to your site’s home page. Without a blog, that’s probably right. But when you do have a quality blog, lots more people will find those blog individual pages in the search listings, click on them, read that post, and only then go to your home page if your content is good enough for them to want to know more. Here's a hard data point that illustrates this. Over the last 90 days, only 5.6% of people who came to one of my key sites from the search engines landed first on the homepage. EVERYone else went first to another page. I’ve seen many sites where that number has been less than 1%! 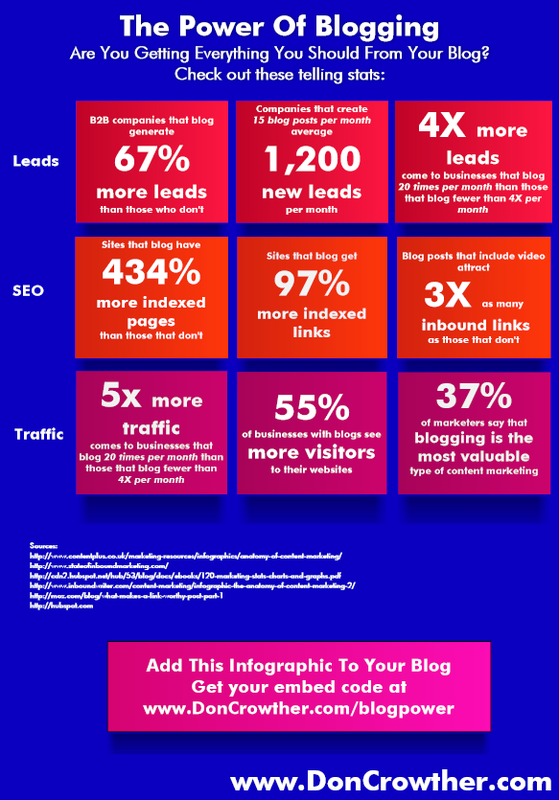 In other words: if you aren’t blogging, you’re missing out on a huge percentage (probably north of 80-90% of the traffic you COULD be getting from the search engines by having more content on your site. Hmmm – write a blog post every day, increase your traffic by 4-5 times? Sounds pretty obvious to me! 2. The more blog posts you have, the more likely you are to have other people link to you, building your traffic through that link and your overall search engine rankings. Good content generates links, as other people refer their readers at specific pages that provides powerful information on the topic of their content. The other kind of link goes to a specific page – these links are much more valuable from a viewer point of view, because they take the viewer to a page that focuses directly on what they’re wanting to know. When I look at the fresh (last 21 days) incoming links to my sites, the majority of those links go to pages other than the home page. In one case the percentage of links going to pages in my blog is 59.8%, 51% on a second, 63.7% on a third, and a whopping 85.2% on a third. In other words, blogging gives you additional pages to which people are more likely to link. That drives direct traffic through the link, search engine positioning, search engine traffic and eventually sales! I could make the exact same argument about social media traffic too. People don’t usually link to your homepage, they link to a specific post on your site that gives the information they’re sharing. As mentioned above, I could make a very successful argument that blog pages help build trust, credibility, desire, etc. But let’s turn again to the hard data that anyone can access through their analytics account. If you have properly set up your analytics account to measure goals and ecommerce conversion, you’ll be able to track what percentage of your optins and purchases involved blog pages. Optins: Only 33.8% of my optins even saw a non-blog page before opting in. Sales: Only 67.4% of my sales included a non-blog page (other than cart pages) in their purchase path. In other words, if I didn’t have a blog, I’d probably miss out on at least 60% of my optins and 30% of my sales. Can you see why I say that the HARD data shows that blogging is an essential element to building sales? I hope I’ve convinced you that you need to do more blogging! 1. The first step to improved blogging is to make a personal and company commitment. Make a specific commitment now (I’m going to blog at least 5 days out of the week for the next 2 months, etc.) Tell us about your commitments and thoughts by posting a comment below. 2. Why not take a moment right now, fire up your blog, write your thoughts about this article, and embed the infographic above into that article? It’s quick and easy and gives great information to your audience. See below for the embed code to add it to your blog. I look forward to seeing your comments, blog posts and social media posts!